The core of ‘Scaredy Cat’ in which a more advanced civilization creates a base among a more primitive society is certainly nothing new even to Doctor Who, but the exploration into evil as well as the scientists’ experiments as they try to physically burn out the very essence of evil from people ensures a unique spin on a classic formula. ‘Scaredy Cat’ takes those elements and goes a step further with the presence of Galayana, the living embodiment of the planet’s morphogenic field and the last living being after an alien race’s biological weapon destroyed everything else. Interestingly, the story posits the idea that all young planets have such a consciousness, revealing the fact that Time Lords are forbidden from traveling to such planets for fear of interfering with development. With C’rizz coming from a universe without time, this is the first story in which he sees the Doctor bound by the laws of time, cause and effect, and non-interference. When the Doctor and he travel back several million years to see just how the planet came to be in its current state and the Doctor later allows him to give the cure to those people knowing that it will make no difference in the end, it’s unsurprising that C’rizz claims not to know the Doctor at all. Further repercussions of these acts will surely be coming in future stories, and it’s a fascinating avenue to explore. Unfortunately, Charley has little memorable to do in this tale, essentially acting as the stereotypical companion who simply asks questions that need asking in order to advance the plot. On the supporting cast side, the main standouts are Michael Chance’s Flood and Arthur Bostrom’s Arken. Flood’s gradual introduction through soliloquies before physically entering events works very well, and Chance manages to stay just on the right side of too extreme to be believable even if his character is ultimately the epitome of cliched villain. Arken is the typically misguided scientist who gives off an air of confidence with his experiments even though it seems clear that he is as unsure as anyone. The other intriguing aspect of this tale is the pacing, speeding up events much more than in the typical Big Finish release. This is a breath of fresh air as the plot zips along to a speedy conclusion without any real padding, but it also creates one of the shortest releases yet at just over seventy minutes. This is a double-edged sword and is sure to create a bit of a divide among listeners. The pacing creates a strange sense of underdevelopment with both characters and events; while many of the ideas presented may not warrant too much further exploration, the sentient planet aspect and its connection to the villain both surely deserve more time even if the chosen voice for Galayana is somewhat grating as it repeatedly taunts ‘scaredy cat’ and is certainly not fitting of the young girl the planet is personified as. 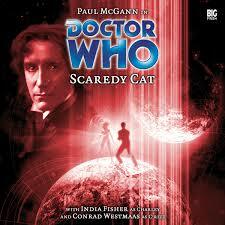 In the end, then, ‘Scaredy Cat’ only comes off as an average release, and a short one at that. It contains several elements that have been included in many stories previously, and the genuinely intriguing elements it does present end up being some of the most underdeveloped. Still, the changing relationship between C’rizz and the Doctor in the real universe should be fascinating to hear unfold. Hopefully the owners will find more to do with Charley as well now that Zagreus and her paradox are firmly in the past.